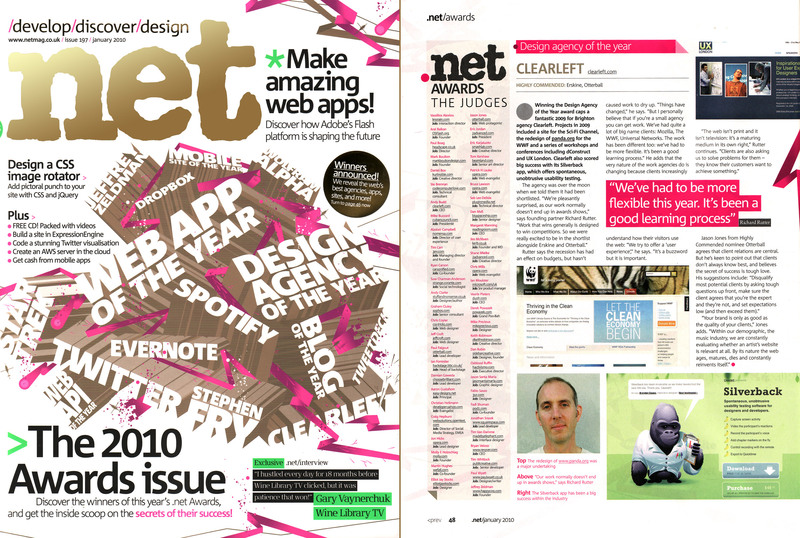 Clearleft has cemented its reputation at the forefront of the digital design industry by being named Design Agency of the Year at the prestigious .net Awards. Amidst tough competition from web design companies across the globe, Clearleft was shortlisted following a public vote, and awarded top spot by a panel of 50 industry judges. The ceremony for the .net Awards was held at Altitude 360 in London’s Millbank Tower last night to celebrate the very best in web design and development. We’re incredibly proud to have won this award. It’s a fantastic honour to be recognised by both the public and our peers. The award is a testament to the dedication of our hardworking team and the opportunities given to us by some wonderful clients. Read .net magazine’s article about us (1.2MB JPG).